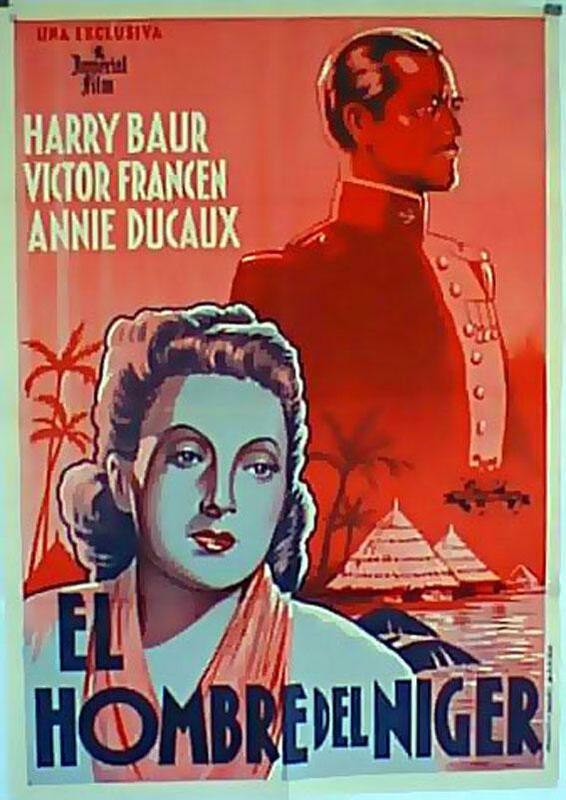 SPFLH 1940 - HOMBRE DEL NIGER, EL - 1940, Dir: JACQUES DE BARONCELLI, Cast: HARRY BAUR, VICTOR FRANCEN, ANNIE DUCAUX, , , Nac. film: FRANCIA, Company: SPFLH, Designer: , , Nac. poster: ESPAÑA, Measures (Cm. and Inches) : -70X100-Cm.-27X41-INCHES-1 SH., , Type of product: POSTER, , POSTER are in excellent condition but may have normal wear such as edge wear or a slight hole. I try photograph any flaw but examining the photos closely is your best bet! Please see bigger picture for details., , La mayoría están en excelentes condiciones, pero puede tener desgaste del borde o algun agujero pequeño. Intento fotografiar cualquier defecto, pero el examen de las fotos de cerca es su mejor opción! Por favor ver la foto en grande para más detalles., , SHIPPING COSTS: Fold posters SPAIN 15? -Correo certificado EUROPE and all world 20? 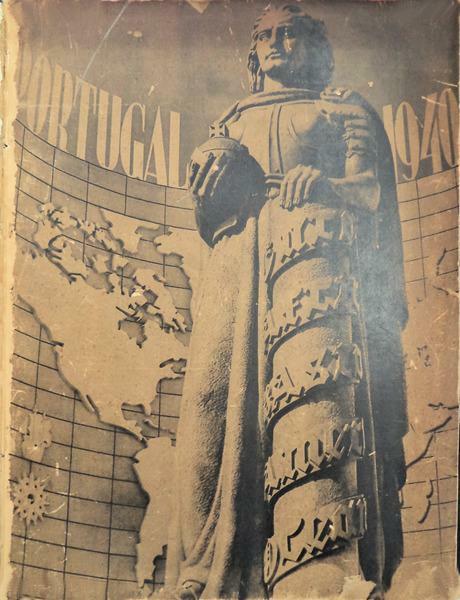 London: Faber and Faber, 1940. Wheat/red cloth. with introductions by Soyetsu Yanagi and Michael Cardew. Stated: First published in May Mcmxl by Faber and Faber Limited. With laid in card addressed to Miss Anna Bogue which states that " -Bernard Leach works here." 293 pgs index. Illustrated with tipped in color plates, drawings and photographs. slight darkening to spine. Rare first printing.. Art. First Edition First Printing.. Cloth. Fine. 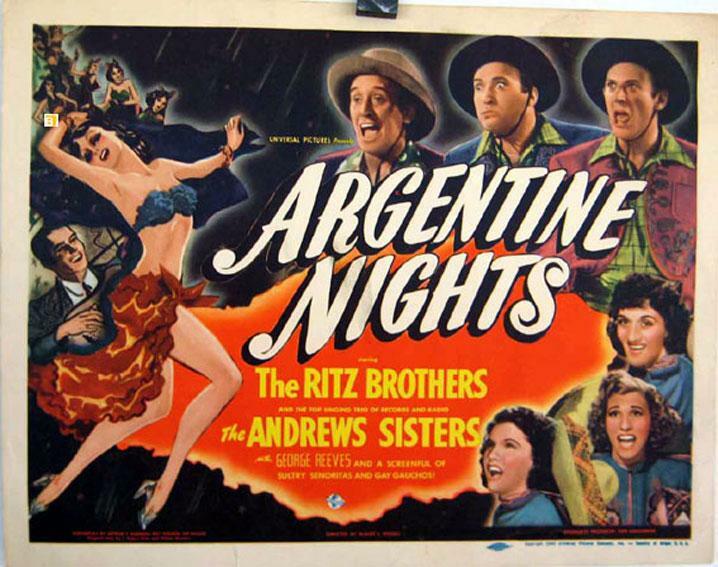 UNIVERSAL 1940 - ARGENTINE NIGHTS - 1940, Dir: ALBERT S. RO, Cast: RITZ BROTHERS, ANDREWS SISTERS, , Nac. film: USA, Company: UNIVERSAL, Designer: , , Nac. poster: USA, Measures (Cm. and Inches) : -70X100-Cm.-27X41-INCHES-1 SH., , Type of product: POSTER, , POSTER are in excellent condition but may have normal wear such as edge wear or a slight hole. I try photograph any flaw but examining the photos closely is your best bet! Please see bigger picture for details., , La mayoría están en excelentes condiciones, pero puede tener desgaste del borde o algun agujero pequeño. Intento fotografiar cualquier defecto, pero el examen de las fotos de cerca es su mejor opción! Por favor ver la foto en grande para más detalles., , SHIPPING COSTS: Fold posters SPAIN 15? -Correo certificado EUROPE and all world 20? 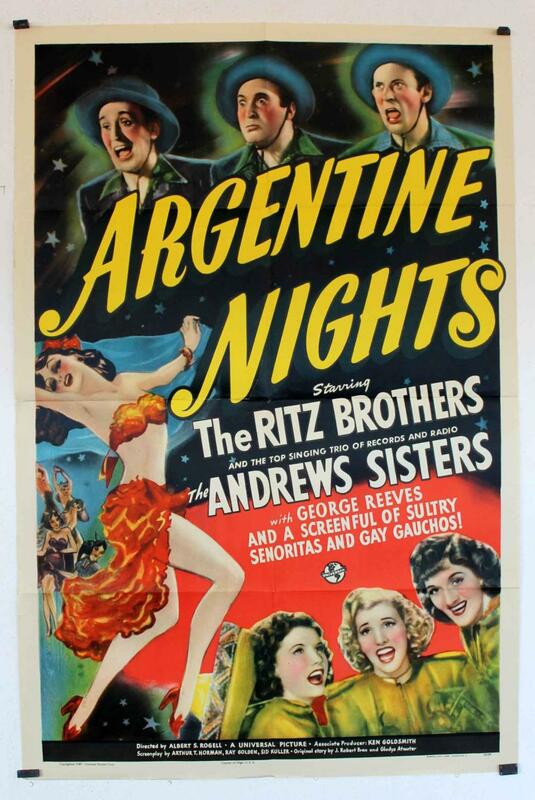 UNIVERSAL 1940 - ARGENTINE NIGHTS - 1940, Dir: ALBERT S. ROGELL, Cast: RITZ BROTHERS, ANDREWS SISTERS, , Nac. film: USA, Company: UNIVERSAL, Designer: , , Nac. poster: USA, Measures (Cm. and Inches) : US -L.C.-28x36-Cm.-11x14-In., Type of product: US LOBBY CARD, , US LOBBY CARD are in excellent condition but may have normal wear such as edge wear or a slight hole. I try photograph any flaw but examining the photos closely is your best bet! Please see bigger picture for details., , La mayoría están en excelentes condiciones, pero puede tener desgaste del borde o algun agujero pequeño. Intento fotografiar cualquier defecto, pero el examen de las fotos de cerca es su mejor opción! Por favor ver la foto en grande para más detalles., , SHIPPING COSTS: Fold posters SPAIN 15? -Correo certificado EUROPE and all world 20? Franz Hanfstaengl. From the estate of Karl Gerhard, NSDAP member and leader of Deutscher Bund Canada. Eight glossy stapled pages illustrated in black and white. 15.5 x 18cm. Text in German. Features thirty-one well-known portraits, seventeen of Hitler, nine of prominent Nazis, and five of other Nazi-related subjects. Includes dimensions, prices, and artist of each work. Presumably this item was widely distributed, thus enabling - and encouraging - German homes and businesses to boldly display their support of the party and its leader throughout the Reich. Unmarked with moderate external soiling and wear. 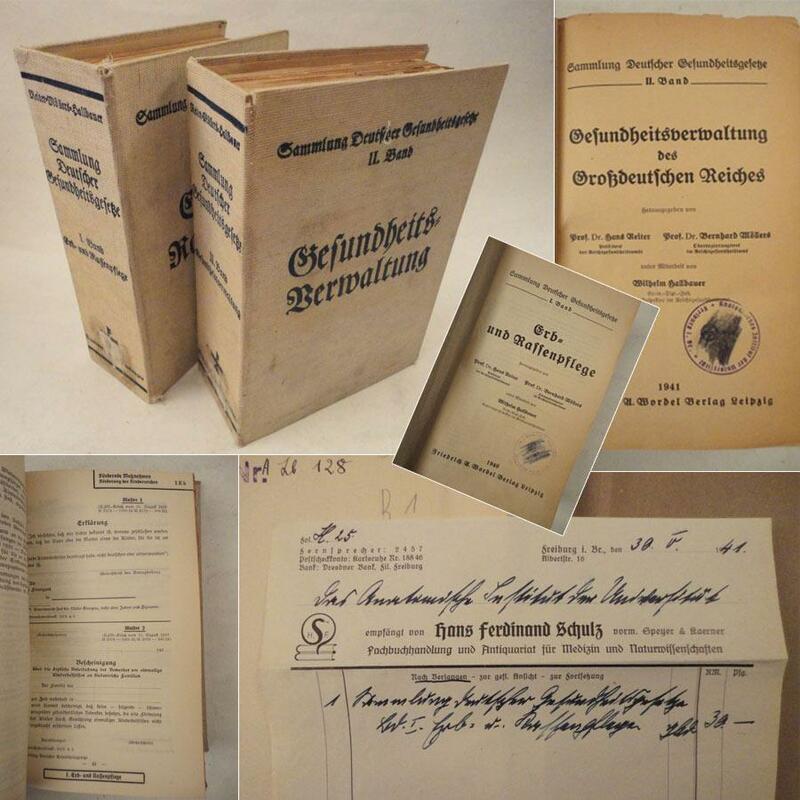 The Deutsche Digitale Bibliotek suggests a printing date of 1940. A rare example of this important piece of Nazi ephemera. 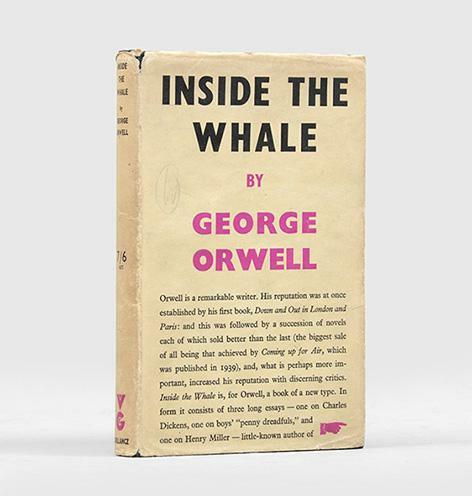 Inside the Whale and Other Essays. COLUMBIA 1940 - QUELLI DELLA VIRGINIA - 1940, Dir: FRANK LLOYD, Cast: CARY GRANT, MARTHA SCOTT, CEDRIC HARDWICKE, , , Nac. film: USA, Company: COLUMBIA, Designer: AUTHOR, , Nac. poster: ITALIA, Measures (Cm. and Inches) : 205X100-CM.-81X41-IN.-3 SH., Type of product: POSTER, , POSTER are in excellent condition but may have normal wear such as edge wear or a slight hole. I try photograph any flaw but examining the photos closely is your best bet! Please see bigger picture for details., , La mayoría están en excelentes condiciones, pero puede tener desgaste del borde o algun agujero pequeño. Intento fotografiar cualquier defecto, pero el examen de las fotos de cerca es su mejor opción! Por favor ver la foto en grande para más detalles., , SHIPPING COSTS: Fold posters SPAIN 15? -Correo certificado EUROPE and all world 20? 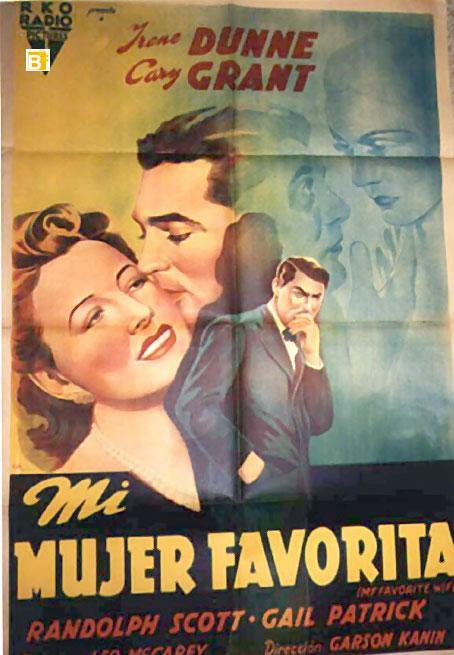 RKO 1940 - MI MUJER FAVORITA - 1940, Dir: GARSON KANIN, Cast: CARY GRANT, IRENE DUNNE, RANDOLPH SCOTT, GAIL PATRICK, , Nac. film: USA, Company: RKO, Designer: , , Nac. poster: ARGENTINA, Measures (Cm. and Inches) : -70X100-Cm.-27X41-INCHES-1 SH., , Type of product: POSTER, , POSTER are in excellent condition but may have normal wear such as edge wear or a slight hole. I try photograph any flaw but examining the photos closely is your best bet! Please see bigger picture for details., , La mayoría están en excelentes condiciones, pero puede tener desgaste del borde o algun agujero pequeño. Intento fotografiar cualquier defecto, pero el examen de las fotos de cerca es su mejor opción! Por favor ver la foto en grande para más detalles., , SHIPPING COSTS: Fold posters SPAIN 15? -Correo certificado EUROPE and all world 20? 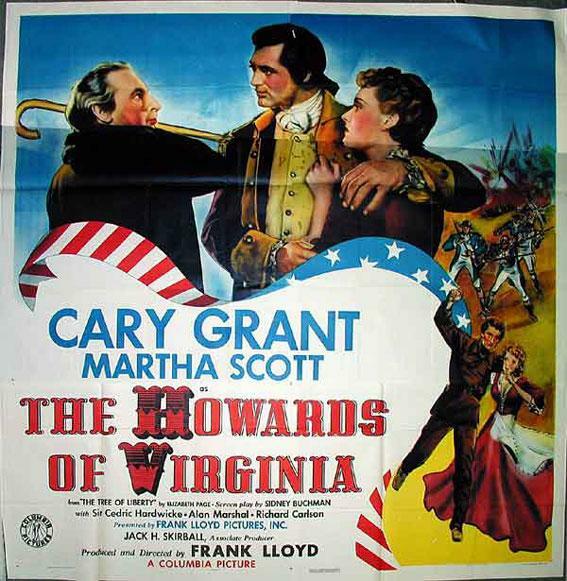 COLUMBIA 1940 - HOWARDS OF VIRGINIA, THE - 1940, Dir: FRANK LLOYD, Cast: CARY GRANT, MARTHA SCOTT, , Nac. film: USA, Company: COLUMBIA, Designer: , , Nac. poster: USA, Measures (Cm. and Inches) : -70X100-Cm.-27X41-INCHES-1 SH., , Type of product: POSTER, , POSTER are in excellent condition but may have normal wear such as edge wear or a slight hole. I try photograph any flaw but examining the photos closely is your best bet! Please see bigger picture for details., , La mayoría están en excelentes condiciones, pero puede tener desgaste del borde o algun agujero pequeño. Intento fotografiar cualquier defecto, pero el examen de las fotos de cerca es su mejor opción! Por favor ver la foto en grande para más detalles., , SHIPPING COSTS: Fold posters SPAIN 15? -Correo certificado EUROPE and all world 20? 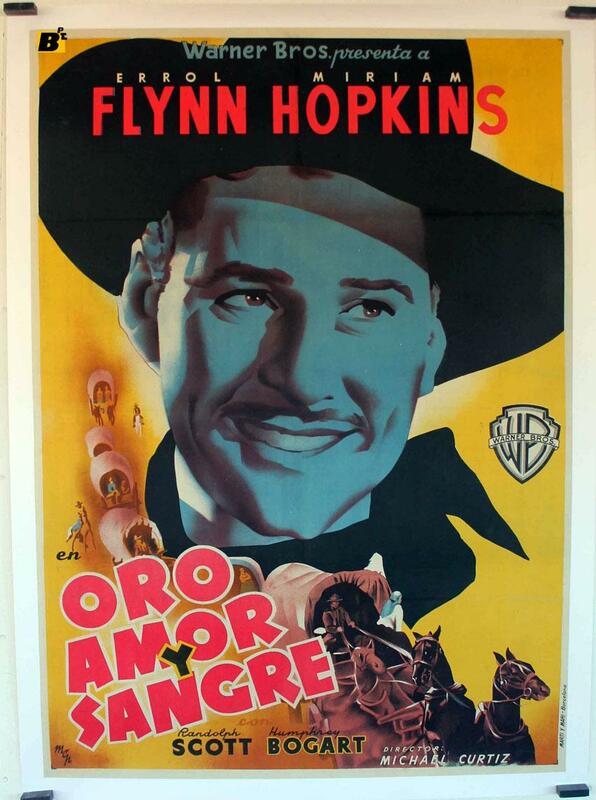 WARNER 1940 - ORO, AMOR Y SANGRE - 1940, Dir: MICHAEL CURTIZ, Cast: ERROL FLYNN, MIRIAM HOPKINS, RANDOLPH SCOTT, HUMPHREY BOGART, , Nac. 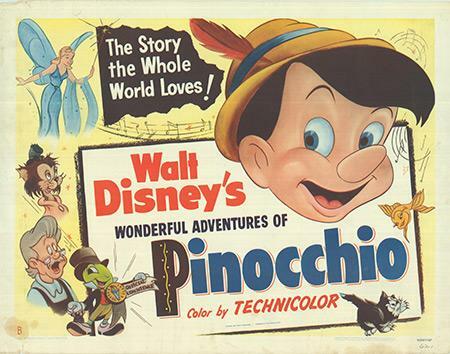 film: USA, Company: WARNER, Designer: AUTHOR, , Nac. poster: ESPAÑA, Measures (Cm. and Inches) : -70X100-Cm.-27X41-INCHES-1 SH., , Type of product: POSTER, , POSTER are in excellent condition but may have normal wear such as edge wear or a slight hole. I try photograph any flaw but examining the photos closely is your best bet! Please see bigger picture for details., , La mayoría están en excelentes condiciones, pero puede tener desgaste del borde o algun agujero pequeño. Intento fotografiar cualquier defecto, pero el examen de las fotos de cerca es su mejor opción! Por favor ver la foto en grande para más detalles., , SHIPPING COSTS: Fold posters SPAIN 15? -Correo certificado EUROPE and all world 20? 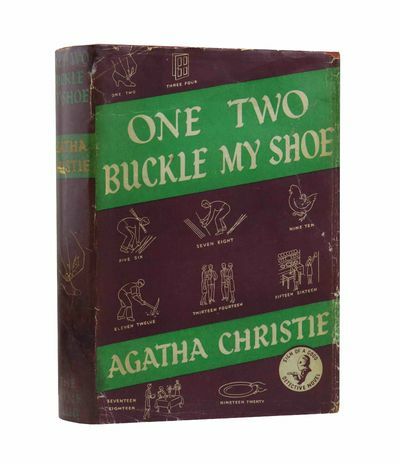 The First UK printing published by The Minerva Publishing Co. Ltd (London) in 1940. The BOOK is in Very Good+ condition. Some rubbing to the edges and corners. Some age related markings to the boards. The binding remains tight. Light toning to the text block and page edges. Previous owner's neat small bookplate to the second blank end paper. A loose Mylar archival covering protects the boards. Three beautifully illustrated classic Polish tales. In the late 1930s renowned Polish poet Julian Tuwim, was asked to write three poems for children. 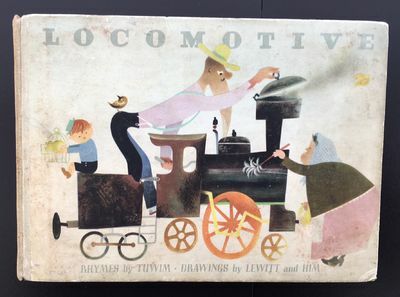 The publisher Przeworski connected the three poems into one book, 'Locomotive', and commissioned illustrations from celebrated Polish illustration duo Lewitt and Him. Locomotive was the beginning of a creative partnership that lasted many years. Featuring the original three poems, Locomotive, The Turnip, and The Birds Broadcast, children learn whats inside each train carriage as it chugs along, how many people, animals, and friends it takes to pull a turnip from the ground, and what happens when birds of all kinds gather for a meeting in the woods. After its original publication in 1939 in Polish, Locomotive was swiftly translated into French and English the next year, appearing at a time when it would have been a surprise and a joy to encounter bright colors and imagery. Very Scarce as the first english edition. Recently reissued by 'Thames and Hudson' publishers. Collectible. Ashton Rare Books welcomes direct contact. Verona: Officina Bodoni, , 1940. Rilegato (hardback). Molto Buono (Very Good). Dedica e firma autografe dell'Autore (Inscribed and signed by the Author). Discorso tenuto il 15 settembre 1940-XVIII nella Sala del Mappamondo in Siena per l'Accademia Musicale Chigiana. 8vo. pp. 32. 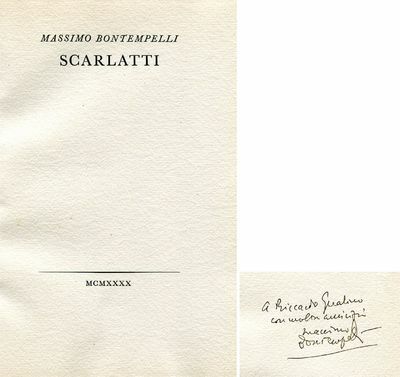 Dedica e firma autografe dell'Autore (Inscribed and signed by the Author). Molto Buono (Very Good). Prima edizione di 200 es. numerati (First Edition). Near Fine. Large oblong quarto. 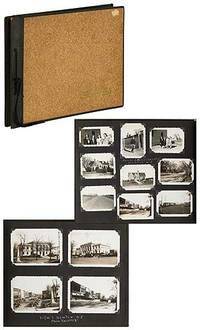 String-tied quarter leather and cork over boards with "Photographs" in gilt. 210 images, mostly gelatin silver, in a wide variety of sizes, mostly larger but one as small as .75" x 1" to as large as 8" x 10". Small scrape on front board, near fine, internally the images are fine. Well-captioned in white album ink identifying the subjects and their locations. Compiled by a ham radio operator, the album begins with a large group shot of radio operators with badges dated in 1940. Several following shots are from Newton, North Carolina, the compiler's home town, the photos are taken from "Skipper" presumably the compiler's car. These are followed by images of many individual operators, some taken in person at meetings at Canobie Lake, New Hampshire and Rosenberg, Texas; and several others seem to have been sent to the compiler from operators from Cincinnati, Galveston, Indiana, New Zealand, Pennsylvania, New Jersey, New England, California, and many other locations. A nicely composed album of a specific type of community in a very narrow time period from late 1940 to mid-Summer 1941. - Large oblong quarto. 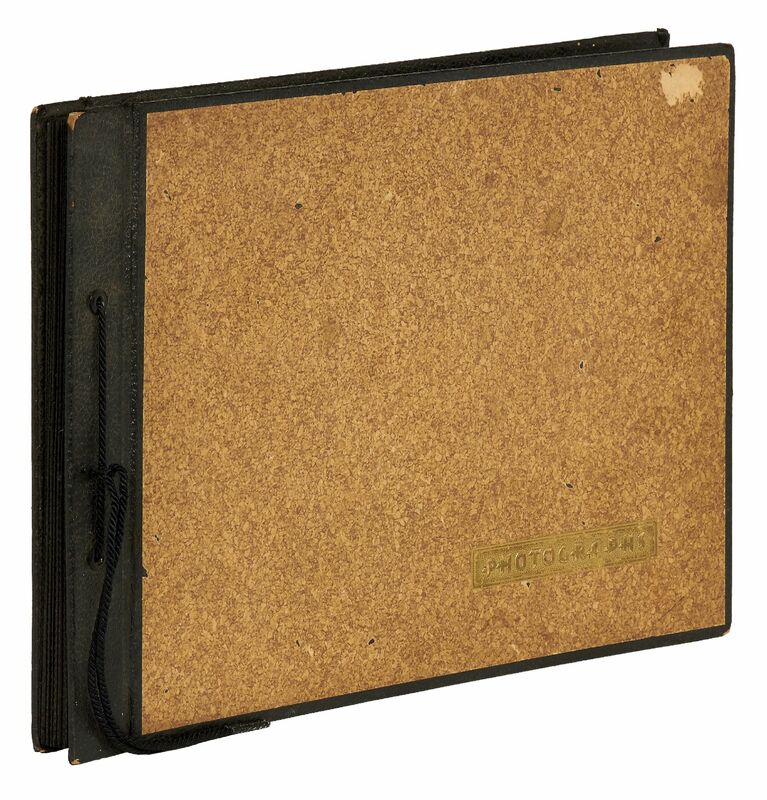 String-tied quarter leather and cork over boards with "Photographs" in gilt. 210 images, mostly gelatin silver, in a wide variety of sizes, mostly larger but one as small as .75" x 1" to as large as 8" x 10". Small scrape on front board, near fine, internally the images are fine. Well-captioned in white album ink identifying the subjects and their locations. Compiled by a ham radio operator, the album begins with a large group shot of radio operators with badges dated in 1940. Several following shots are from Newton, North Carolina, the compiler's home town, the photos are taken from "Skipper" presumably the compiler's car. These are followed by images of many individual operators, some taken in person at meetings at Canobie Lake, New Hampshire and Rosenberg, Texas; and several others seem to have been sent to the compiler from operators from Cincinnati, Galveston, Indiana, New Zealand, Pennsylvania, New Jersey, New England, California, and many other locations. A nicely composed album of a specific type of community in a very narrow time period from late 1940 to mid-Summer 1941. 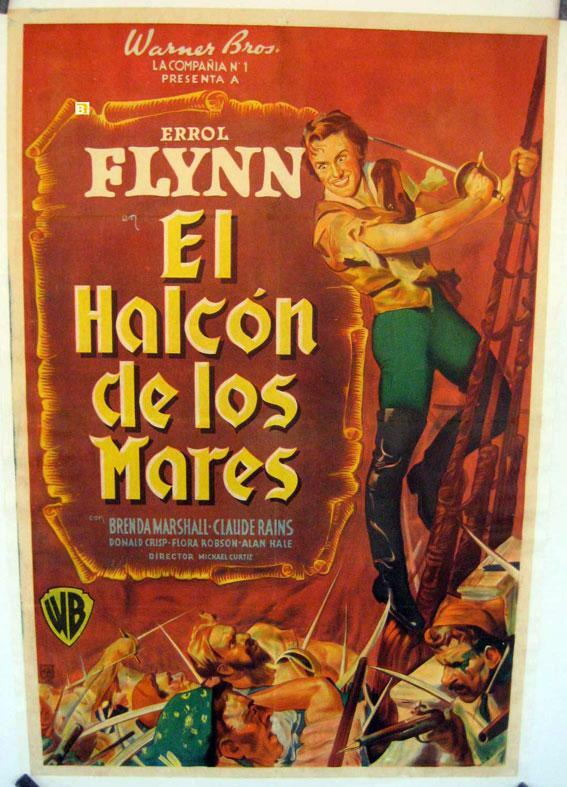 WARNER 1940 - HALCON DE LOS MARES, EL - 1940, Dir: MICHAEL CURTIZ, Cast: ERROL FLYNN, BRENDA MARSHALL, CLAUDE RAINS, ALAN HALE, HENRY DANIELL, UNA O'CONNOR, FLORA ROBSON, , , Nac. film: USA, Company: WARNER, Designer: , , Nac. poster: ARGENTINA, Measures (Cm. and Inches) : -70X100-Cm.-27X41-INCHES-1 SH., - ON LINEN, Type of product: POSTER, , POSTER are in excellent condition but may have normal wear such as edge wear or a slight hole. I try photograph any flaw but examining the photos closely is your best bet! Please see bigger picture for details., , La mayoría están en excelentes condiciones, pero puede tener desgaste del borde o algun agujero pequeño. Intento fotografiar cualquier defecto, pero el examen de las fotos de cerca es su mejor opción! Por favor ver la foto en grande para más detalles., , SHIPPING COSTS: Fold posters SPAIN 15? -Correo certificado EUROPE and all world 20? Boston: Houghton Mifflin Company, 1940. First Edition. Hardcover. Very Good. First edition. Very Good+ in Very Good dust jacket. Endpapers a bit foxed with slight offsetting, spine cloth a bit rubbed along edges, a tiny light stain near head. Jacket spine panel moderately sunned, well-worn along edges, chipped head and worn tail, small chip in top of front panel, price intact ($2.50). 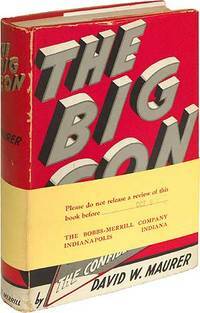 The author's only book, an unjustly-obscure "country noir" novel acclaimed by the likes of Daniel Woodrell, George V. Higgins, Flannery O'Connor and Raymond Chandler. Quite scarce in its original pictorial jacket by George Kelley ominously showing the roadhouse/filling-station where the story takes place. 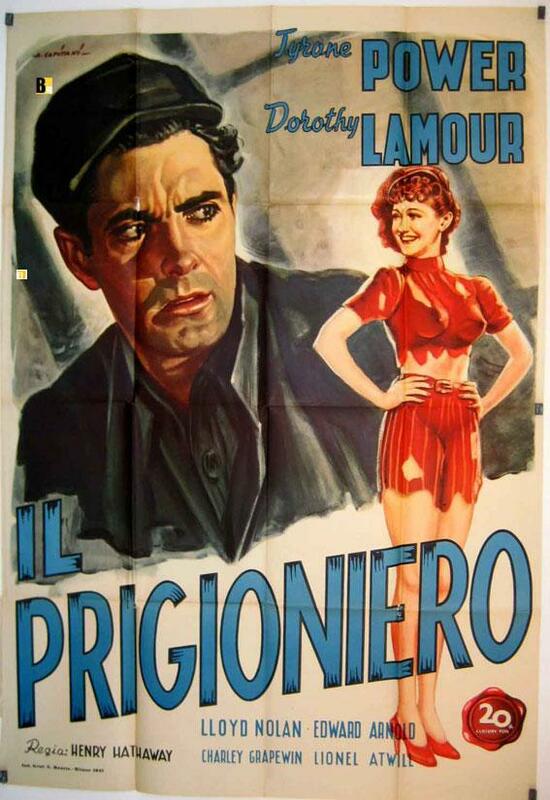 FOX 1940 - PRIGIONIERO, IL - 1940, Dir: HENRY HATHAWAY, Cast: TYRONE POWER, DOROTHY LAMOUR, EDWARD ARNOLD, LLOYD NOLAN, CHARLES GRAPEWIN, LIONEL ATWILL, JONATHAN HALE, , , Nac. film: USA, Company: FOX, Designer: , , Nac. poster: ITALIA, Measures (Cm. and Inches) : -100X140-Cm.-40X55-INCHES-2 SH., , Type of product: POSTER, , POSTER are in excellent condition but may have normal wear such as edge wear or a slight hole. I try photograph any flaw but examining the photos closely is your best bet! Please see bigger picture for details., , La mayoría están en excelentes condiciones, pero puede tener desgaste del borde o algun agujero pequeño. Intento fotografiar cualquier defecto, pero el examen de las fotos de cerca es su mejor opción! Por favor ver la foto en grande para más detalles., , SHIPPING COSTS: Fold posters SPAIN 15? -Correo certificado EUROPE and all world 20? 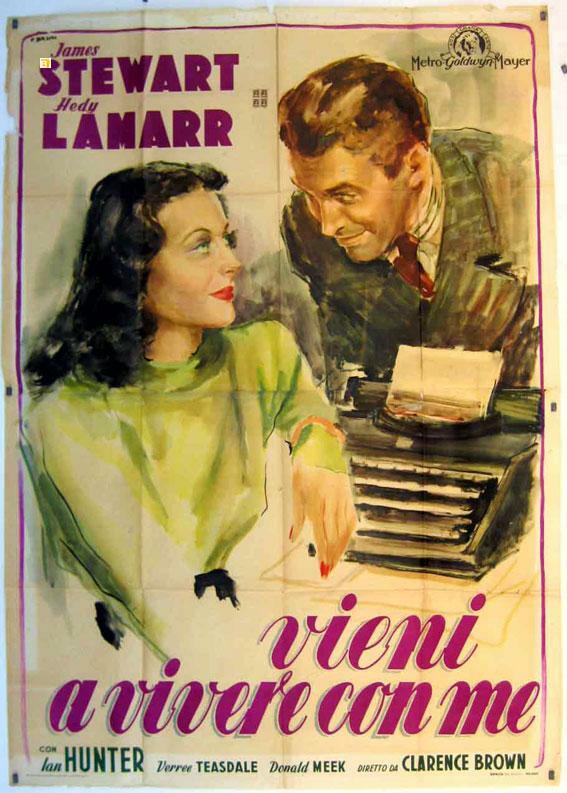 METRO 1940 - VIENI A VIVERE CON ME - 1940, Dir: CLARENCE BROWN, Cast: JAMES STEWART, HEDY LAMARR, , Nac. film: USA, Company: METRO, Designer: BRINI, , Nac. poster: ITALIA, Measures (Cm. and Inches) : 200X 140CM 55X80 INC., Type of product: POSTER, , POSTER are in excellent condition but may have normal wear such as edge wear or a slight hole. I try photograph any flaw but examining the photos closely is your best bet! Please see bigger picture for details., , La mayoría están en excelentes condiciones, pero puede tener desgaste del borde o algun agujero pequeño. Intento fotografiar cualquier defecto, pero el examen de las fotos de cerca es su mejor opción! Por favor ver la foto en grande para más detalles., , SHIPPING COSTS: Fold posters SPAIN 15? -Correo certificado EUROPE and all world 20? 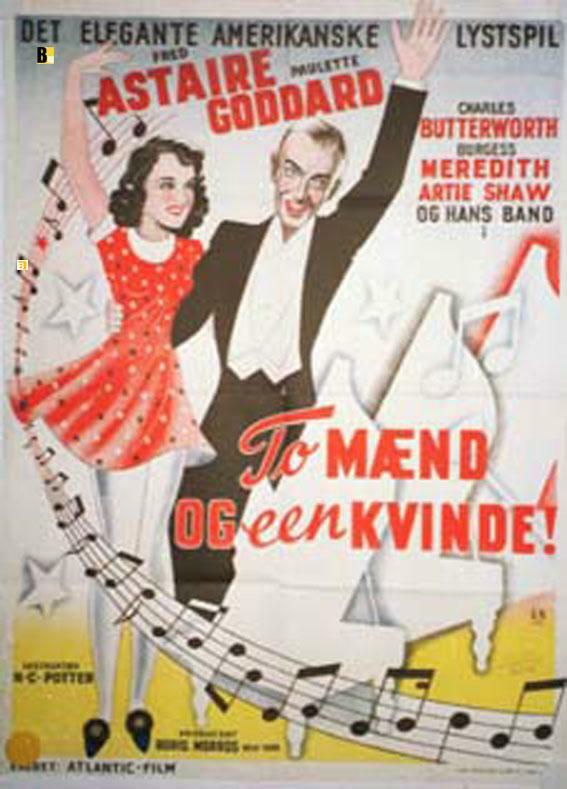 PARAMOUNT 1940 - MAEND OG EEN KVINDE, TO - 1940, Dir: HENRY C. POTTER, Cast: FRED ASTAIRE, PAULETTE GODDARD, CHARLES BUTTER WORTH, BURGESS MEREDITH, ARTIE SHAW, , , Nac. film: USA, Company: PARAMOUNT, Designer: , , Nac. poster: DINAMARCA, Measures (Cm. and Inches) : -60X80-Cm.-26X36-INCHES , , Type of product: POSTER, , POSTER are in excellent condition but may have normal wear such as edge wear or a slight hole. I try photograph any flaw but examining the photos closely is your best bet! Please see bigger picture for details., , La mayoría están en excelentes condiciones, pero puede tener desgaste del borde o algun agujero pequeño. Intento fotografiar cualquier defecto, pero el examen de las fotos de cerca es su mejor opción! Por favor ver la foto en grande para más detalles., , SHIPPING COSTS: Fold posters SPAIN 15? -Correo certificado EUROPE and all world 20? 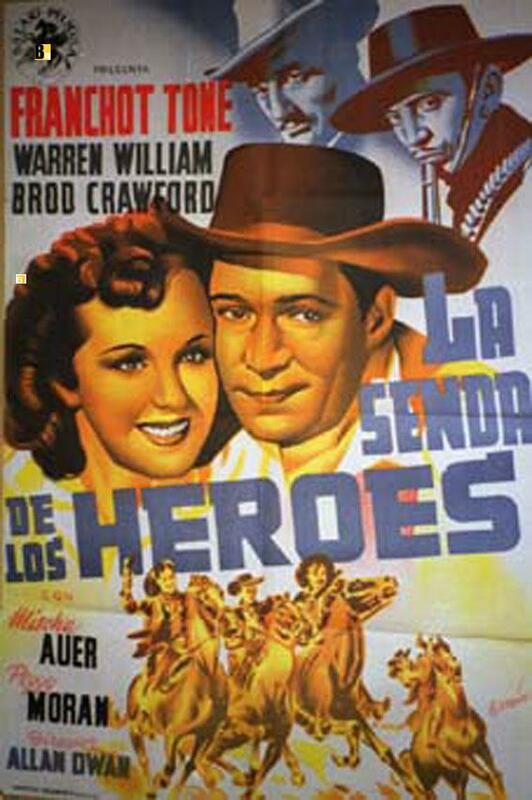 UNIVERSAL 1940 - SENDA DE LOS HEROES, LA - 1940, Dir: ALLAN DWAN, Cast: FRANCHOT TONE, MISCHA AUER, , Nac. film: USA, Company: UNIVERSAL, Designer: RAMON, , Nac. poster: ESPAÑA, Measures (Cm. and Inches) : -70X100-Cm.-27X41-INCHES-1 SH., , Type of product: POSTER, , POSTER are in excellent condition but may have normal wear such as edge wear or a slight hole. I try photograph any flaw but examining the photos closely is your best bet! Please see bigger picture for details., , La mayoría están en excelentes condiciones, pero puede tener desgaste del borde o algun agujero pequeño. Intento fotografiar cualquier defecto, pero el examen de las fotos de cerca es su mejor opción! Por favor ver la foto en grande para más detalles., , SHIPPING COSTS: Fold posters SPAIN 15? -Correo certificado EUROPE and all world 20? 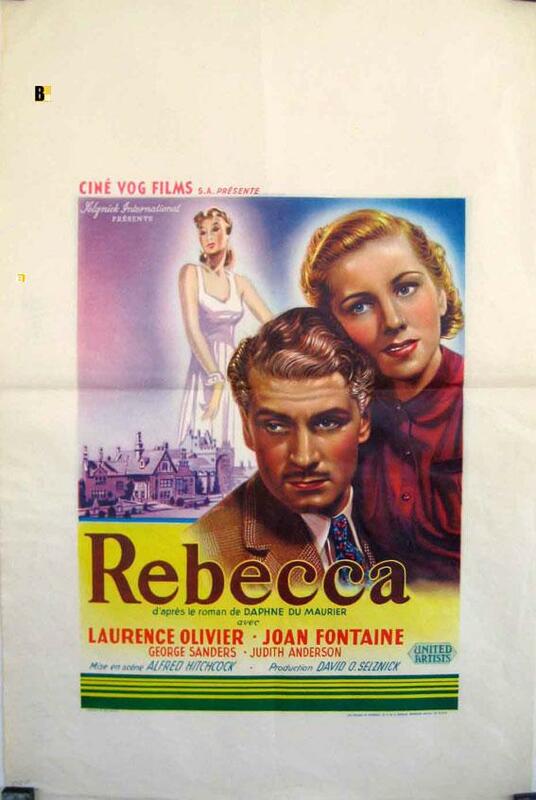 UNITED ARTISTS 1940 - REBECCA - 1940, Dir: ALFRED HITCHCOCK, Cast: LAURENCE OLIVIER, JOAN FONTAINE, GEORGE SANDERS, NIGEL BRUCE, LEO G. CARROLL, C. AUBREY SMITH, GLADYS COOPER, JUDITH ANDERSON, , Nac. film: USA, Company: UNITED ARTISTS, Designer: , , Nac. poster: BELGICA, Measures (Cm. and Inches) : -35X46-Cm.-14X18-INCHES, , Type of product: POSTER, , POSTER are in excellent condition but may have normal wear such as edge wear or a slight hole. I try photograph any flaw but examining the photos closely is your best bet! Please see bigger picture for details., , La mayoría están en excelentes condiciones, pero puede tener desgaste del borde o algun agujero pequeño. Intento fotografiar cualquier defecto, pero el examen de las fotos de cerca es su mejor opción! Por favor ver la foto en grande para más detalles., , SHIPPING COSTS: Fold posters SPAIN 15? -Correo certificado EUROPE and all world 20? 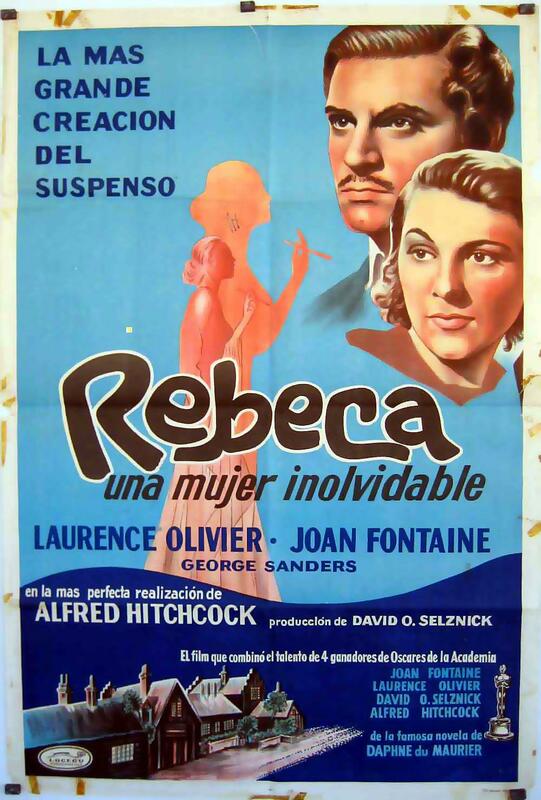 UNITED ARTISTS 1940 - REBECA - 1940, Dir: ALFRED HITCHCOCK, Cast: LAURENCE OLIVIER, JOAN FONTAINE, GEORGE SANDERS, JUDITH ANDERSON, NIGEL BRUCE, , , Nac. film: USA, Company: UNITED ARTISTS, Designer: , , Nac. poster: ARGENTINA, Measures (Cm. and Inches) : -70X100-Cm.-27X41-INCHES-1 SH., , Type of product: POSTER, , POSTER are in excellent condition but may have normal wear such as edge wear or a slight hole. I try photograph any flaw but examining the photos closely is your best bet! Please see bigger picture for details., , La mayoría están en excelentes condiciones, pero puede tener desgaste del borde o algun agujero pequeño. Intento fotografiar cualquier defecto, pero el examen de las fotos de cerca es su mejor opción! Por favor ver la foto en grande para más detalles., , SHIPPING COSTS: Fold posters SPAIN 15? -Correo certificado EUROPE and all world 20? 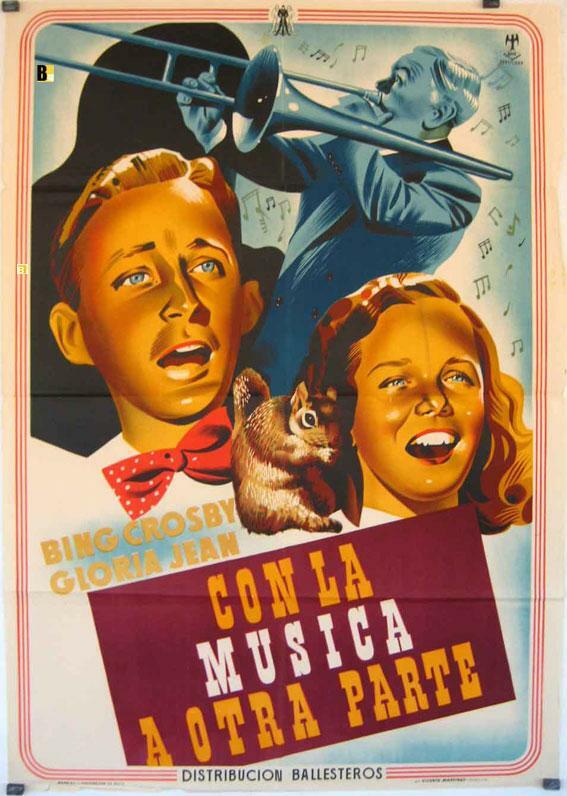 UNIVERSAL 1940 - CON LA MUSICA A OTRA PARTE - 1940, Dir: DAVID BUTLER, Cast: BING CROSBY, GLORIA JEAN, , Nac. film: USA, Company: UNIVERSAL, Designer: RAMON, , Nac. poster: ESPAÑA, Measures (Cm. and Inches) : -70X100-Cm.-27X41-INCHES-1 SH., , Type of product: POSTER, , POSTER are in excellent condition but may have normal wear such as edge wear or a slight hole. I try photograph any flaw but examining the photos closely is your best bet! Please see bigger picture for details., , La mayoría están en excelentes condiciones, pero puede tener desgaste del borde o algun agujero pequeño. Intento fotografiar cualquier defecto, pero el examen de las fotos de cerca es su mejor opción! Por favor ver la foto en grande para más detalles., , SHIPPING COSTS: Fold posters SPAIN 15? -Correo certificado EUROPE and all world 20? 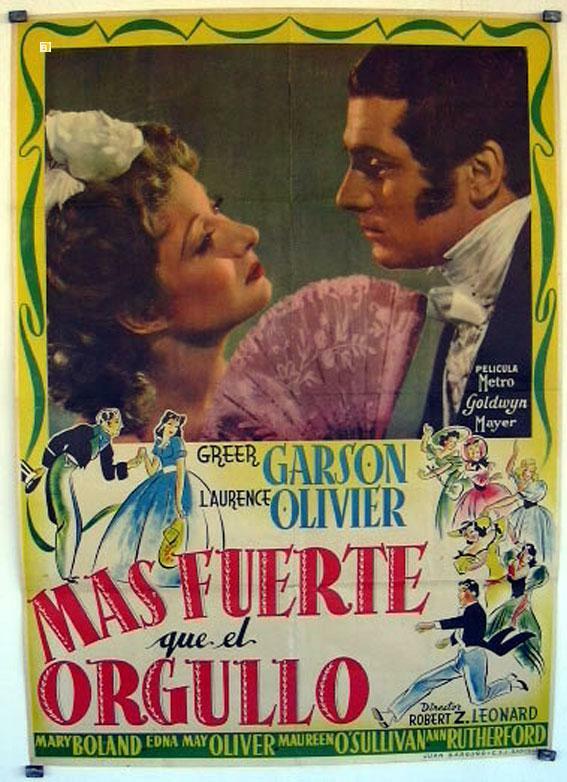 METRO 1940 - MAS FUERTE QUE EL ORGULLO - 1940, Dir: ROBERT Z. LEONARD, Cast: GREER GARSON, LAURENCE OLIVIER, , Nac. film: USA, Company: METRO, Designer: Hirschfeld, , Nac. poster: ESPAÑA, Measures (Cm. and Inches) : -70X100-Cm.-27X41-INCHES-1 SH., , Type of product: POSTER, , POSTER are in excellent condition but may have normal wear such as edge wear or a slight hole. I try photograph any flaw but examining the photos closely is your best bet! Please see bigger picture for details., , La mayoría están en excelentes condiciones, pero puede tener desgaste del borde o algun agujero pequeño. Intento fotografiar cualquier defecto, pero el examen de las fotos de cerca es su mejor opción! Por favor ver la foto en grande para más detalles., , SHIPPING COSTS: Fold posters SPAIN 15? -Correo certificado EUROPE and all world 20? 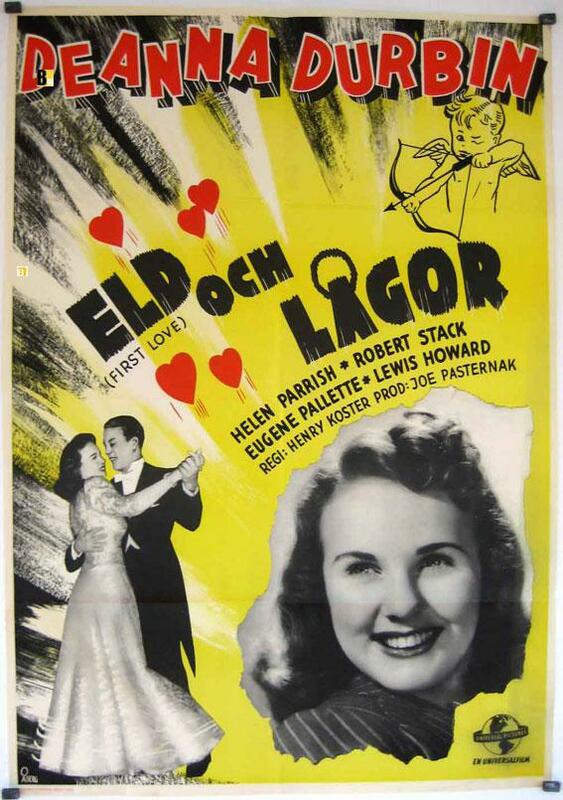 UNIVERSAL 1940 - ELD OCH LAGOR - 1940, Dir: HENRY KOSTER, Cast: DEANNE DURBIN, HELEN PARRISH, ROBERT STACK, EUGENE PAULETTE, LEWIS HOWARD, , , Nac. film: USA, Company: UNIVERSAL, Designer: , , Nac. poster: SUECIA, Measures (Cm. and Inches) : -70X100-Cm.-27X41-INCHES-1 SH., , Type of product: POSTER, , POSTER are in excellent condition but may have normal wear such as edge wear or a slight hole. I try photograph any flaw but examining the photos closely is your best bet! Please see bigger picture for details., , La mayoría están en excelentes condiciones, pero puede tener desgaste del borde o algun agujero pequeño. Intento fotografiar cualquier defecto, pero el examen de las fotos de cerca es su mejor opción! Por favor ver la foto en grande para más detalles., , SHIPPING COSTS: Fold posters SPAIN 15? -Correo certificado EUROPE and all world 20? La maison du péché. Ouvrage orné d'eaux-fortes originales en couleurs de Henri Jourdain. 4. 2 Bl., 355 S., 1 Bl. mit zahlr. farb. Orig.-Radierungen. Mauvefarbiger Ldr. um 1940 mit goldgepr. Rückentitel, farb. floraler Ornamentik, Innenkantenverg., Kopfgoldschnitt u. Seidenmoiree-Vorsätzen (sign. [Henri] Creuzevault). Mahé III, 537. - Eines von 99 Exemplaren für die Mitglieder der Société du Livre d'Art. - In hervorragenden Meistereinband des berühmten franz. Buchbinders H. Creuzevault (1905-1971), der mehrfach ausgezeichnet wurde u.a. mit dem "Premier Prix de reliure" auf der Exposition Internationale in Paris 1937. - Gelenke minimal berieben, sehr gutes Exemplar. 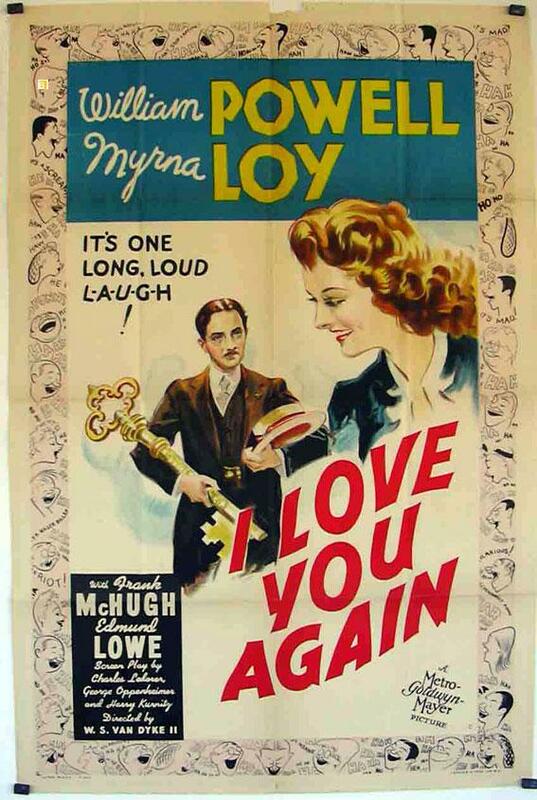 METRO 1940 - I LOVE YOU AGAIN - 1940, Dir: VAN DYKE, W S, Cast: MYRNA LOY, WILLIAM POWELL, , Nac. film: USA, Company: METRO, Designer: , , Nac. poster: USA, Measures (Cm. and Inches) : -70X100-Cm.-27X41-INCHES-1 SH., , Type of product: POSTER, , POSTER are in excellent condition but may have normal wear such as edge wear or a slight hole. I try photograph any flaw but examining the photos closely is your best bet! Please see bigger picture for details., , La mayoría están en excelentes condiciones, pero puede tener desgaste del borde o algun agujero pequeño. Intento fotografiar cualquier defecto, pero el examen de las fotos de cerca es su mejor opción! Por favor ver la foto en grande para más detalles., , SHIPPING COSTS: Fold posters SPAIN 15? -Correo certificado EUROPE and all world 20? 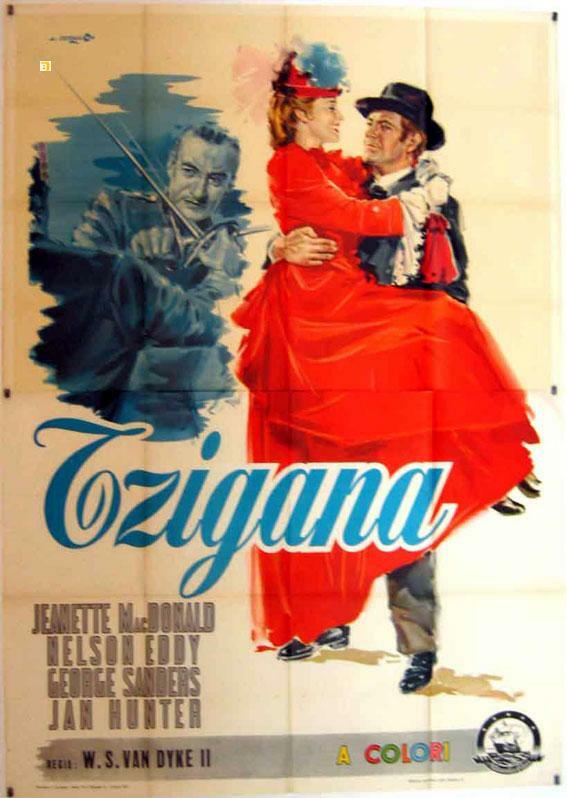 METRO 1940 - TZIGANA - 1940, Dir: W, S. VAN DYKE, Cast: JEANETTE MACDONALD, NELSON EDDY, GEORGE SANDERS, IAN HUNTER, FELIX BRESSART, , , Nac. film: USA, Company: METRO, Designer: , , Nac. poster: ITALIA, Measures (Cm. and Inches) : 200X 140CM 55X80 INC., Type of product: POSTER, , POSTER are in excellent condition but may have normal wear such as edge wear or a slight hole. I try photograph any flaw but examining the photos closely is your best bet! Please see bigger picture for details., , La mayoría están en excelentes condiciones, pero puede tener desgaste del borde o algun agujero pequeño. Intento fotografiar cualquier defecto, pero el examen de las fotos de cerca es su mejor opción! Por favor ver la foto en grande para más detalles., , SHIPPING COSTS: Fold posters SPAIN 15? -Correo certificado EUROPE and all world 20? Samuel Kravitt,, [c.1940]. Black and white matt photograph (330 x 255 mm). In excellent condition. Mounted on card, glazed, and presented in a brown wooden frame. 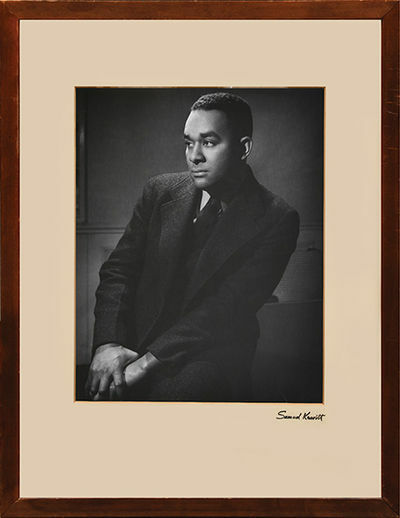 A striking three-quarter portrait photograph of American author Richard Wright (19081960). Samuel Kravitt (19132000) was active as a photographer throughout the 1930s and 1940s before transitioning from still photography to filmmaking in the 1950s. His work can be found in the collections of several prestigious American institutions, including the Library of Congress, Yale University, the New York State Museum, and the Wolfsonian-Florida International University Museum of Art and Design. Collins, 1940. 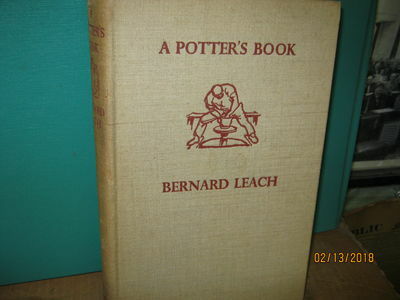 A first edition, first printing published by Collins in 1940. A very good+ book with one neat name to front pastedown - some dark patches to the spine - fraying a little to the foot of the front corner of the board. In a dust wrapper which has benefitted from some neat restoration to the spine ends and to the hinges. Evident internally. Clipped. A rare Poirot novel. Indianapolis / New York: Bobbs-Merrill, 1940. First edition. Fine in an about near fine dustwrapper, rubbed along the hinges and with a couple of tiny closed tears. This copy with the publisher's original yellow wraparound review band. Also laid into the book are three different promotional notices from the publisher, all in manual type, with biographical information about the author, and even an offer to send him questions by mail. A fascinating and exceptionally uncommon non-fiction account of con-men, and the definitive work on the subject. It was the primary reference used by David S. Ward for his original screenplay for the film The Sting. Maurer managed to effect a settlement with the studio when he showed that a single line from the book was identical to one of the stage directions. An important antecedent to one of the best films of the past few decades. The 1973 George Roy Hill-directed film featuring Paul Newman, Robert Redford, and Robert Shaw won seven Academy Awards including Best Picture, Director, and Screenplay. Scarce in jacket, exceptionally so with the review band. 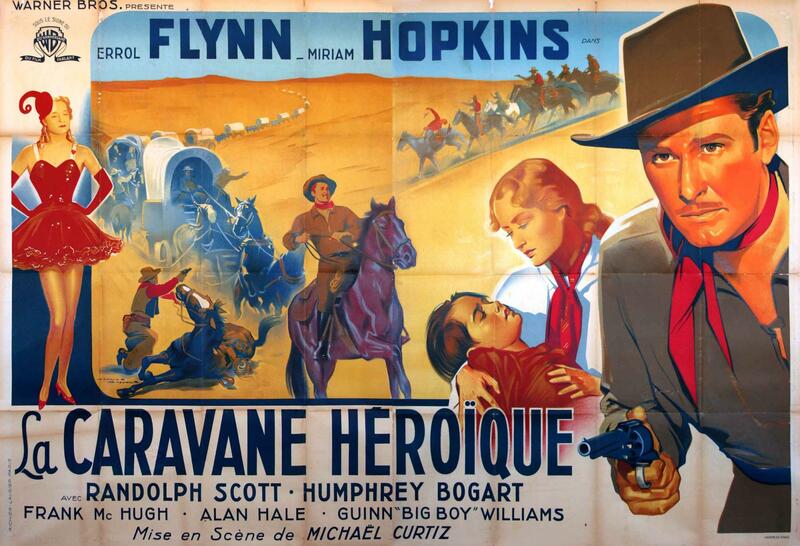 WARNER 1940 - CARAVANE HEROIQUE, LA - 1940, Dir: MICHAEL CURTIZ, Cast: ERROL FLYNN, MIRIAM HOPKINS, RANDOLPH SCOTT, HUMPHREY BOGART, , Nac. film: USA, Company: WARNER, Designer: CRISTELL, , Nac. poster: FRANCIA, Measures (Cm. and Inches) : 160x240-CM.-63x94-IN., Type of product: POSTER, , POSTER are in excellent condition but may have normal wear such as edge wear or a slight hole. I try photograph any flaw but examining the photos closely is your best bet! Please see bigger picture for details., , La mayoría están en excelentes condiciones, pero puede tener desgaste del borde o algun agujero pequeño. Intento fotografiar cualquier defecto, pero el examen de las fotos de cerca es su mejor opción! Por favor ver la foto en grande para más detalles., , SHIPPING COSTS: Fold posters SPAIN 15? -Correo certificado EUROPE and all world 20? 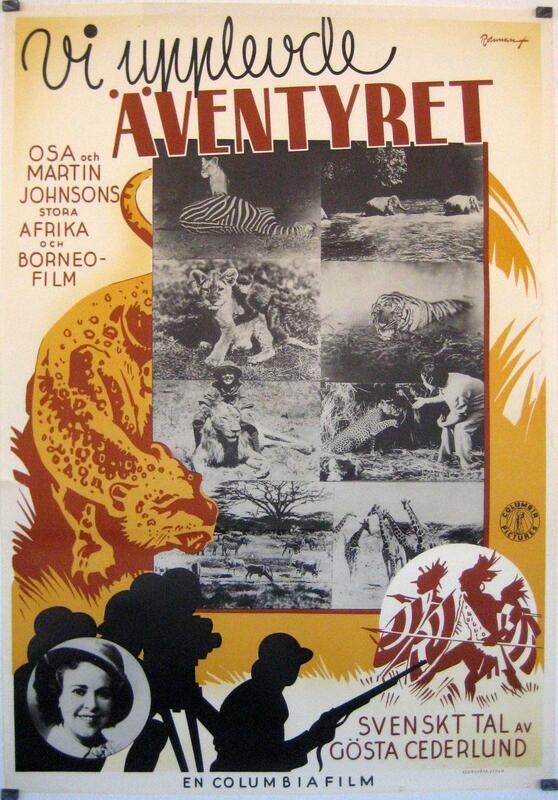 COLUMBIA 1940 - VI UPPLEVDE AVENTYRET - 1940, Dir: DON CLARK - ALBERT DUFFY, Cast: JIM BANNON, MARTIN E. JOHNSON, OSA JOHNSON, , Nac. film: USA, Company: COLUMBIA, Designer: , , Nac. poster: SUECIA, Measures (Cm. and Inches) : 70X100-CM.-27X41-IN-1 SH., Type of product: POSTER, , POSTER are in excellent condition but may have normal wear such as edge wear or a slight hole. I try photograph any flaw but examining the photos closely is your best bet! Please see bigger picture for details., , La mayoría están en excelentes condiciones, pero puede tener desgaste del borde o algun agujero pequeño. Intento fotografiar cualquier defecto, pero el examen de las fotos de cerca es su mejor opción! Por favor ver la foto en grande para más detalles., , SHIPPING COSTS: Fold posters SPAIN 15? -Correo certificado EUROPE and all world 20? 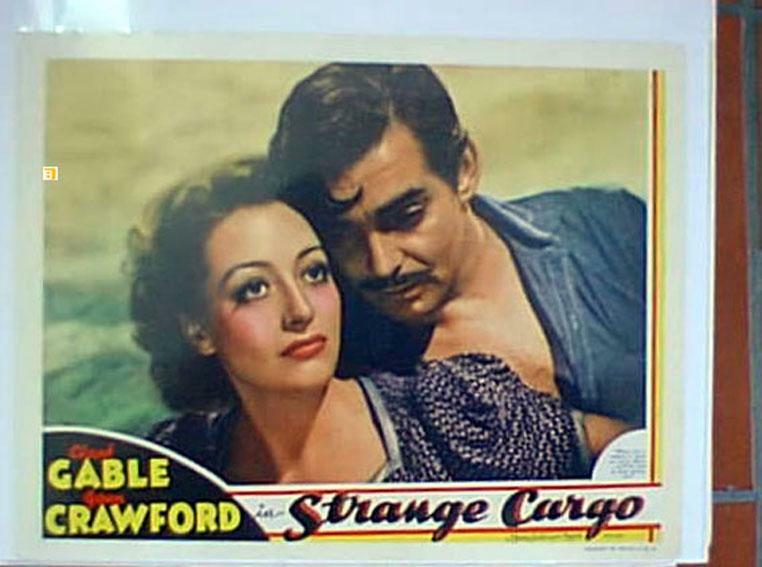 METRO 1940 - STRANGE CARGO - 1940, Dir: FRANK BORZAGE, Cast: CLARK GABLE, JOAN CRAWFORD, IAN HUNTER, , , Nac. film: USA, Company: METRO, Designer: , , Nac. poster: USA, Measures (Cm. and Inches) : US -L.C.-28x36-Cm.-11x14-In., Type of product: US LOBBY CARD, , US LOBBY CARD are in excellent condition but may have normal wear such as edge wear or a slight hole. I try photograph any flaw but examining the photos closely is your best bet! Please see bigger picture for details., , La mayoría están en excelentes condiciones, pero puede tener desgaste del borde o algun agujero pequeño. Intento fotografiar cualquier defecto, pero el examen de las fotos de cerca es su mejor opción! Por favor ver la foto en grande para más detalles., , SHIPPING COSTS: Fold posters SPAIN 15? -Correo certificado EUROPE and all world 20? 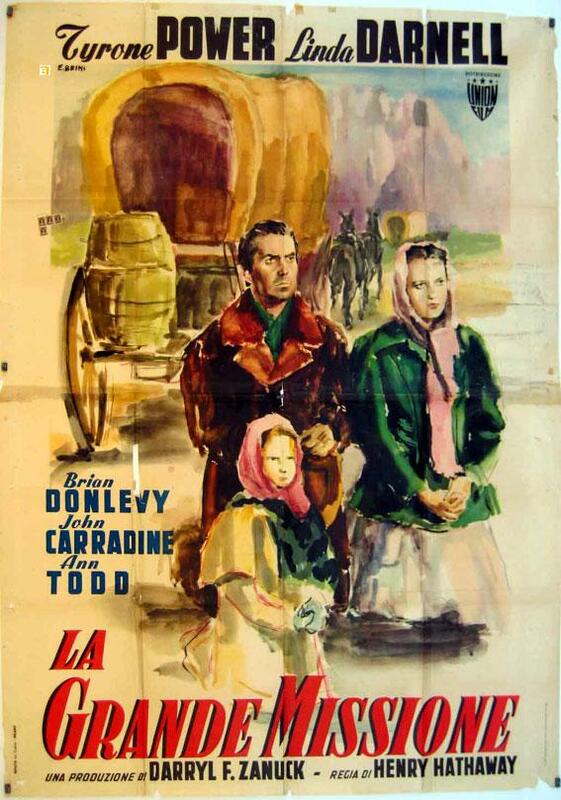 FOX 1940 - ZANE GREY S WESTERN UNION - 1940, Dir: FRITZ LANG, Cast: ROBERT YOUNG, RANDOLPH SCOTT, DEAN JAGGER, , , Nac. film: USA, Company: FOX, Designer: , , Nac. poster: GRAN BRETAÑA USA, Measures (Cm. and Inches) : -205x100-Cm.-81x41-In.-3 SH., Type of product: POSTER, , POSTER are in excellent condition but may have normal wear such as edge wear or a slight hole. I try photograph any flaw but examining the photos closely is your best bet! Please see bigger picture for details., , La mayoría están en excelentes condiciones, pero puede tener desgaste del borde o algun agujero pequeño. Intento fotografiar cualquier defecto, pero el examen de las fotos de cerca es su mejor opción! Por favor ver la foto en grande para más detalles., , SHIPPING COSTS: Fold posters SPAIN 15? -Correo certificado EUROPE and all world 20? FOX 1940 - GRANDE MISSIONE, LA - 1940, Dir: HENRY HATHAWAY, Cast: TYRONE POWER, LINDA DARNELL, DEAN JAGGER, BRIAN DONLEVY, JOHN CARRADINE, , , Nac. film: USA, Company: FOX, Designer: BRINI, , Nac. poster: ITALIA, Measures (Cm. and Inches) : -100X140-Cm.-40X55-INCHES-2 SH., Type of product: POSTER, , POSTER are in excellent condition but may have normal wear such as edge wear or a slight hole. I try photograph any flaw but examining the photos closely is your best bet! Please see bigger picture for details., , La mayoría están en excelentes condiciones, pero puede tener desgaste del borde o algun agujero pequeño. Intento fotografiar cualquier defecto, pero el examen de las fotos de cerca es su mejor opción! Por favor ver la foto en grande para más detalles., , SHIPPING COSTS: Fold posters SPAIN 15? -Correo certificado EUROPE and all world 20? Kbhvn. : Udgivet af Selskabet for grafisk Kunst, Høst 1940. Illustr. med træsnit af Povl Christensen. 160 s. Helt rent og velholdt ubeskåret eksemplar med guldsnit foroven indbundet med de orig. omslag i smukt helbind af okkerfarvet gedeskind med blindtrykte dekorationer tegnet af Tyge Hvass. Bindet signeret Anker Kyster 1941 [Henrik Park]. Indlagt i smuk tilhørende bogæske med blindtryk på skindryggen. 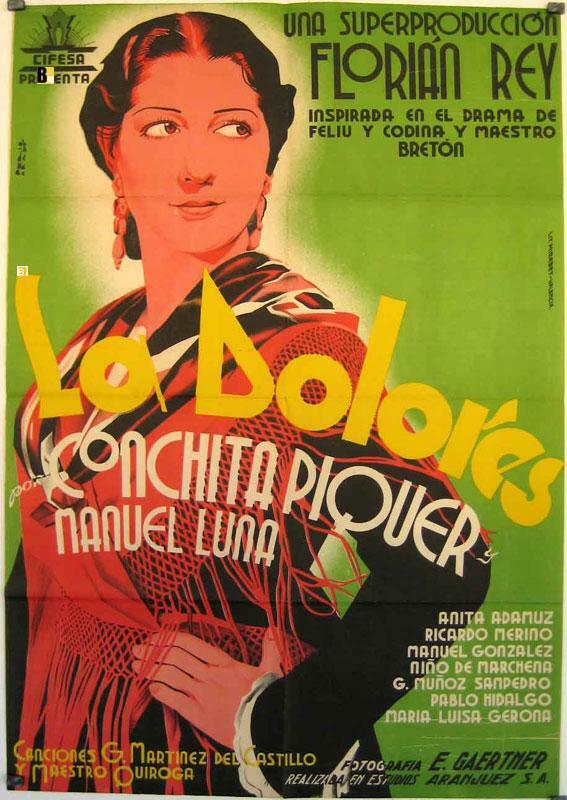 CIFESA 1940 - DOLORES, LA - 1940, Dir: FLORIAN REY, Cast: MANUEL LUNA, PEPE MARCHENA, CONCHITA PIQUER, , , Nac. film: ESPAÑA, Company: CIFESA, Designer: PERIS ARAGO, , Nac. poster: ESPAÑA, Measures (Cm. and Inches) : -70X100-Cm.-27X41-INCHES-1 SH., , Type of product: POSTER, , POSTER are in excellent condition but may have normal wear such as edge wear or a slight hole. I try photograph any flaw but examining the photos closely is your best bet! Please see bigger picture for details., , La mayoría están en excelentes condiciones, pero puede tener desgaste del borde o algun agujero pequeño. Intento fotografiar cualquier defecto, pero el examen de las fotos de cerca es su mejor opción! Por favor ver la foto en grande para más detalles., , SHIPPING COSTS: Fold posters SPAIN 15? -Correo certificado EUROPE and all world 20? 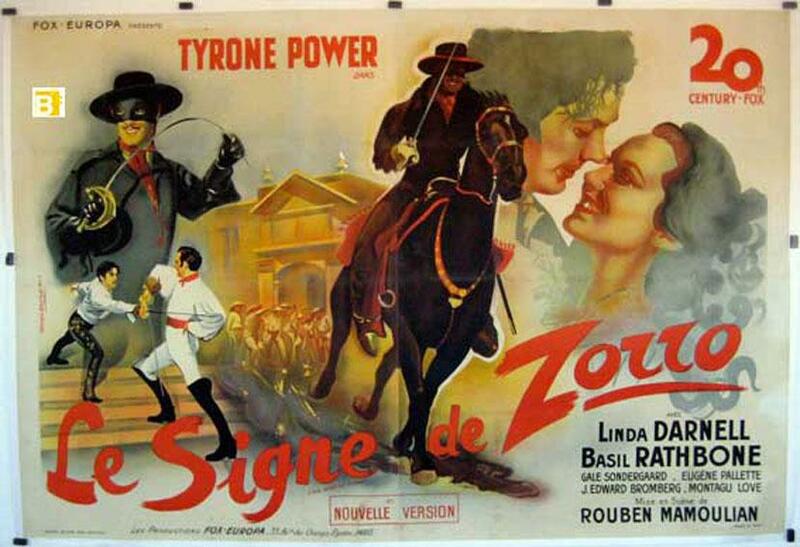 FOX 1940 - SIGNE DE ZORRO, LE - 1940, Dir: ROUBEN MAMOULIAN, Cast: TYRONE POWER, LINDA DARNELL, BASIL RATHBONE, , , Nac. film: USA, Company: FOX, Designer: BELINSKY, , Nac. poster: FRANCIA, Measures (Cm. and Inches) : 160x240-CM.-63x94-IN.- ON LINEN, Type of product: POSTER, , POSTER are in excellent condition but may have normal wear such as edge wear or a slight hole. I try photograph any flaw but examining the photos closely is your best bet! Please see bigger picture for details., , La mayoría están en excelentes condiciones, pero puede tener desgaste del borde o algun agujero pequeño. Intento fotografiar cualquier defecto, pero el examen de las fotos de cerca es su mejor opción! Por favor ver la foto en grande para más detalles., , SHIPPING COSTS: Fold posters SPAIN 15? -Correo certificado EUROPE and all world 20? 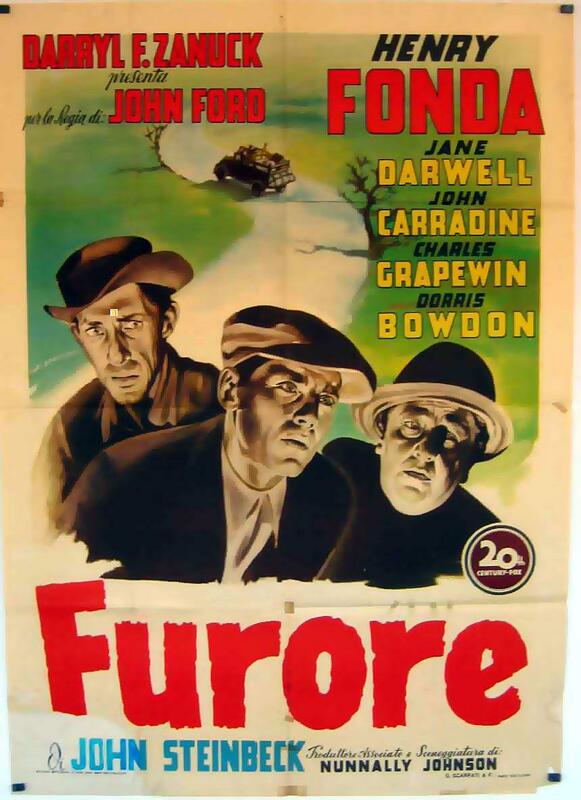 FOX 1940 - FURORE - 1940, Dir: JOHN FORD, Cast: HENRY FONDA, JANE DARWELL, JOHN CARRADINE, CHARLEY GRAPEWIN, DORRIS BOWDON, RUSSELL SIMPSON, WARD BOND, , , Nac. film: USA, Company: FOX, Designer: , , Nac. poster: ITALIA, Measures (Cm. and Inches) : -100X140-Cm.-40X55-INCHES-2 SH., - ON LINEN, Type of product: POSTER, , POSTER are in excellent condition but may have normal wear such as edge wear or a slight hole. I try photograph any flaw but examining the photos closely is your best bet! Please see bigger picture for details., , La mayoría están en excelentes condiciones, pero puede tener desgaste del borde o algun agujero pequeño. Intento fotografiar cualquier defecto, pero el examen de las fotos de cerca es su mejor opción! Por favor ver la foto en grande para más detalles., , SHIPPING COSTS: Fold posters SPAIN 15? -Correo certificado EUROPE and all world 20? 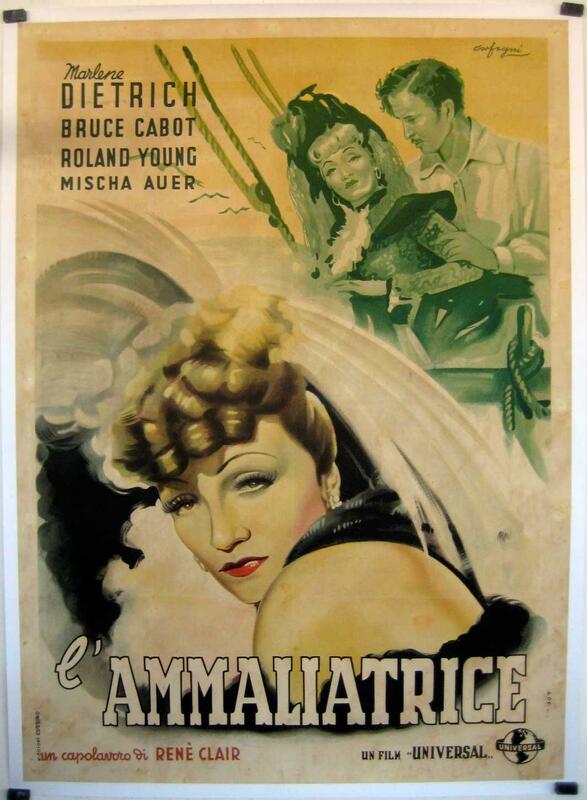 UNIVERSAL 1940 - AMMALIATRICE, L - 1940, Dir: RENE CLAIR, Cast: MARLENE DIETRICH, MISCHA AUER, BRUCE CABOT, ROLAND YOUNG, , Nac. film: USA, Company: UNIVERSAL, Designer: , , Nac. poster: ITALIA, Measures (Cm. and Inches) : -100X140-Cm.-40X55-INCHES-2 SH., - ON LINEN, Type of product: POSTER, , POSTER are in excellent condition but may have normal wear such as edge wear or a slight hole. I try photograph any flaw but examining the photos closely is your best bet! Please see bigger picture for details., , La mayoría están en excelentes condiciones, pero puede tener desgaste del borde o algun agujero pequeño. Intento fotografiar cualquier defecto, pero el examen de las fotos de cerca es su mejor opción! Por favor ver la foto en grande para más detalles., , SHIPPING COSTS: Fold posters SPAIN 15? -Correo certificado EUROPE and all world 20? 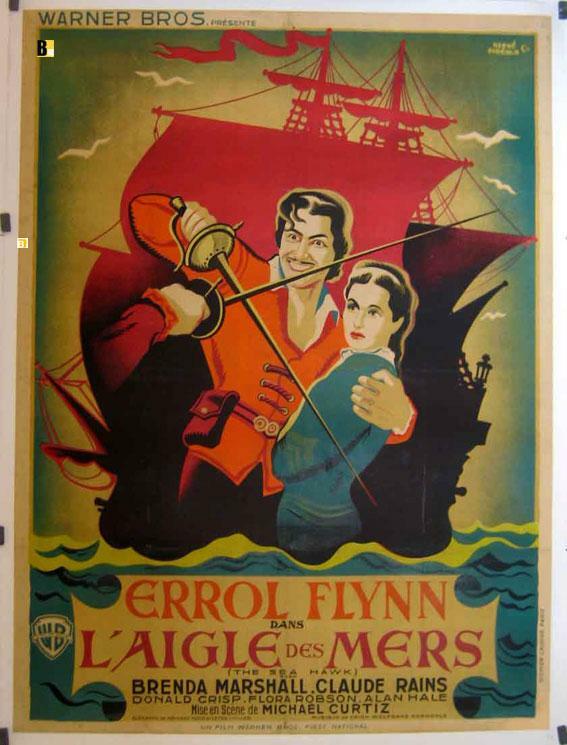 WARNER 1940 - AIGLE DES MERS, L - 1940, Dir: MICHAEL CURTIZ, Cast: ERROL FLYNN, BRENDA MARSHALL, CLAUDE RAINS, ALAN HALE, HENRY DANIELL, UNA O'CONNOR, JAMES STEPHENSON, FLORA ROBSON, , , Nac. film: USA, Company: WARNER, Designer: MORVAN, , Nac. poster: FRANCIA, Measures (Cm. and Inches) : -120X160-Cm.-47X63-INCHES, - ON LINEN, Type of product: POSTER, , POSTER are in excellent condition but may have normal wear such as edge wear or a slight hole. I try photograph any flaw but examining the photos closely is your best bet! Please see bigger picture for details., , La mayoría están en excelentes condiciones, pero puede tener desgaste del borde o algun agujero pequeño. Intento fotografiar cualquier defecto, pero el examen de las fotos de cerca es su mejor opción! Por favor ver la foto en grande para más detalles., , SHIPPING COSTS: Fold posters SPAIN 15? -Correo certificado EUROPE and all world 20?